I feel guilty even calling this a recipe. 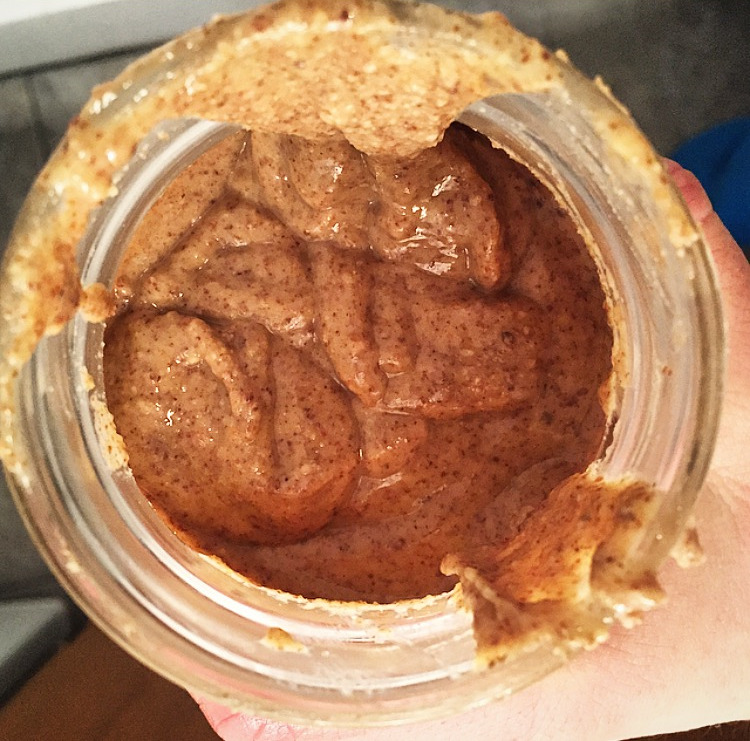 It is so simple that I can not believe I have not made my own nut butter before! Creamy almond butter is now my latest addiction; especially after discovering just how simple it was to make. Simple, as in throw everything in a food processor and watch how the almonds magically turn into a creamy, warm spread! Almond butter contains great healthy fats, fiber, and of course protein and a bonus to making your own nut butter is that you can control the ingredients to your liking and dietary restrictions. You can keep out the added junk that is often in store bought brands. Sweet, savory, roasted, salty, crunchy- you name it- you've got it! -Have a little patience! After ten minutes or so you will be left with a crumbly mixture and think that its not working. Don't fret, somewhere between that ten minutes and the last ten, a creamy mixture will appear! -If you want to bring out the nuttiness of the almonds (or any nut for that matter) try roasting the nuts in the oven on a low temperature for roughly 10 minutes. Let them cool for a few minutes and then begin! -Since the food processor will be continuously running for 20-25 minutes, you want to make sure that you have a powerful food processor that will be able to handle it. ...and that's it. Seriously. If you want plain almond butter, all it takes is a few cups of almonds and you have it. I have not listed the measurements for the cinnamon and sea salt on purpose as it greatly depends on your preference. I started off with a smaller amount of each, around 1 tsp. It is clearly easier to add more than to take away! Pre-heat the oven to 350 degrees. Spread the almonds evenly on the baking sheet and bake for 10 minutes. You will begin to smell the aroma of the almonds and they will start to brown a bit. Make sure you do not over roast the nuts as they will burn! Let cool for a few minutes. Place the almonds in the food processor and begin! After 10 minutes you are left with a crumbly mixture that slightly resembles sand. At the 10 minute mark, I scrapped the sides of the food processor and then continued to process. After a second 10 minutes has passed it will begin to form into a creamy paste. At this point you want to add in the sea salt and cinnamon. This is where you can also control the texture of the almond butter. Chunky, creamy, super creamy, etc. Taste test as you go as well to add extra cinnamon and sea salt. After 20 minutes, I let the food processor continue for another 5 minutes as I like my almond butter creamy. I then finished it off with a dash of cinnamon and sprinkle of sea salt. I stored mine in a mason jar and can either be left at room temperature or in the fridge. Cayenne or paprika for a quick!